Stock photo aerial view showing Boulevard Lake in the Current River Greenway and Grain Elevators lining the waterfront of Lake Superior in the City of Thunder Bay, Ontario, Canada. 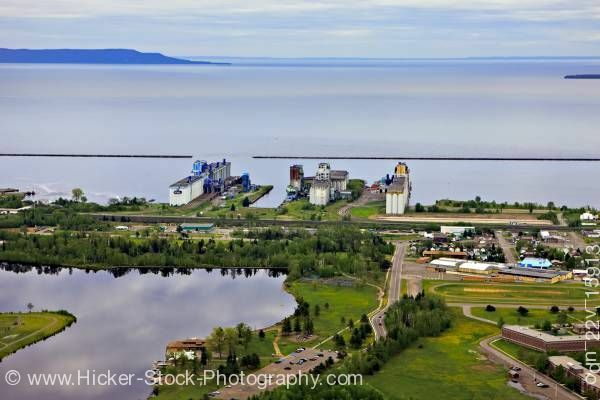 This stock photo gives you an aerial view of Boulevard Lake in the Current River Greenway and Grain Elevators lining the waterfront of Lake Superior in the City of Thunder Bay, Ontario, Canada. The construction of a dam near the mouth of the Current River in 1901 resulted in a head pond flooding the area now developed as Boulevard Lake municipal park, the first in a series of park lands along the rivers shores.